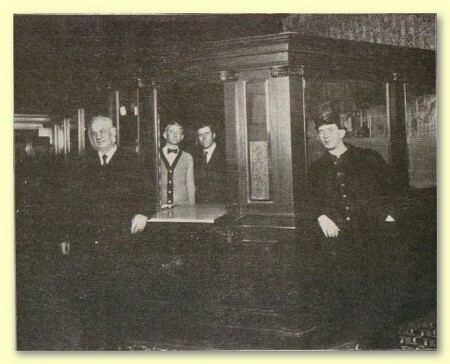 This financial institution was organized January 1, 1901. It has a capital stock of ten thousand dollars. Owen Harbage is president; E. W. Johnson, cashier, and R. C. Millikin, assistant cashier. All business men of wealth and standing in the county. Mr. Harbage is a native of England, but has lived here since 11 years of age. He is a capitalist, large farmer and stock raiser. E. W. Johnson was born in the county. Is a graduate of Ada, with degree of B. A., and a graduate of the Law Department with degree of Bachelor of Laws. He was admitted to the Bar in 1903. In addition to being cashier he is legal counsel for the bank. Mr. Johnson is popular as banker and as a lawyer. R. C. Millikin is also a West Jefferson product. He is the son of the late A. C. Millikin, former Vice President of the bank, and one time County Commissioner. Mr. Millikin has received a special business education, and that, with his experience, makes him qualified to take the active part of the actual work in the bank. It is thus seen that the officers of The Farmers are men wholly worthy the confidence of depositors. The Farmers does a general banking business, makes collections, issues foreign exchange, discounts paper, and loans money. Its policy is liberal, but consistent with sound business methods.